← Martin Ginsberg Intros His Plan for Redevelopment of White Plains Financial Center. Renamed “City Square” Construction to Start this coming Spring. 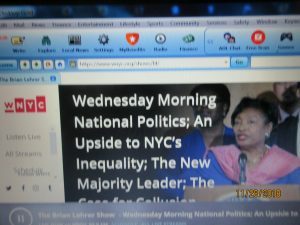 On WNYC’s Brian Lehrer program today, the first African-American woman elected Senate Majority leader, Senator Andrea Stewart-Cousins (Senator from the 35th District, which includes White Plains) told Mr. Lehrer she would explore several priorities to address state problems. She said she would initiate discussions on a single payer health care plan for New York State, noting to Mr. Lehrer that such a program has been often suggested, but the legislature has not discussed it ever, and that she would begin such talks. “That will happen she said. She said there was no point because the previous Republican majority in the senate would not consider it. She brought up a priority on her own: fair funding of less-well-to school districts across the stat: “Where you live should not determine how much aid you receive—get their share. She volunteered that she wanted to explore the issue of codifying the 1973 Roe v. Wade Supreme Court decision into New York State law. New York State passed a woman’s right to abortion in the state in 1970, but did not adapt the Roe V.Wade decision, Stewart-Cousins said because the Republican Party was in the majority for the last 48 years. Lehrer asked Cousins her feelings on being the first woman and first African American woman to be Majority Leader and being now one of the “three people in the room,” and not three men in the room (Governor Andrew M. Cuomo and Assembly Leader Carl Heastie also African-American). Lehrer asked what she hoped for as the first woman and African-American woman to be Senate Majority leader.